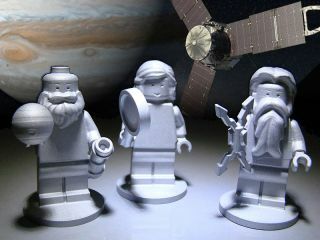 Three LEGO figurines representing the Roman god Jupiter (right), his wife Juno (middle) and Galileo Galilei (left) as shown here will fly to Jupiter on NASA’s Juno spacecraft. They have launched aboard the space shuttle, visited the space station and flown to Mars. Now, three more "very special" LEGO figurines are set to fly to the planet Jupiter with NASA's Juno spacecraft. The specially-constructed LEGO Minifigures are of the Roman god Jupiter, his wife Juno, and "father of science" Galileo Galilei. The LEGO crew's mission is part of the Bricks in Space project, the joint outreach and educational program developed as part of the collaboration between NASA and the LEGO Group to inspire children to explore science, technology, engineering, and mathematics. "NASA has a long-standing partnership with the LEGO company," Scott Bolton, principal investigator for the Juno mission and space science and engineering director at the Southwestern Research Institute in San Antonio, said in a press conference on Wednesday (Aug. 3). "Any of you that have children know that LEGOs are very popular with kids, as well as really helps teach them about building and engineering." "We hope that that [these LEGO Minifigures] will increase awareness of children about the space program and get them interested. This will also help them understand both the mythological studies that went on... and also the contributions that Galileo made," Bolton said. In Greek and Roman mythology, Jupiter (who was the equivalent of "Zeus" to the Greeks) drew a veil of clouds around himself to hide his mischief. From Mount Olympus, Juno was able to peer through the clouds and reveal Jupiter's true nature. The Juno spacecraft will also look beneath the clouds to help NASA understand the planet's structure and history. The LEGO Juno holds a magnifying glass "to signify her search for the truth," while her husband holds a lightning bolt. The third LEGO crew member, Galileo Galilei, made several important discoveries about Jupiter. He was the first to point a telescope at the sky to make astronomical observations and discovered the four largest satellites of Jupiter — named the Galilean moons in his honor. The minifigure Galileo has his telescope with him for the journey to Jupiter. The trio resemble the typical small toys that LEGO sells, but are made out of metal. "They are basically the size of the normal LEGO figures which you will see, but they are made out of aluminum, very special aluminum and they have been prepared in a very special way," Bolton said. "They are made out of a special space-grade aluminum. They have gone through all the testing to make sure that they fit on our spacecraft in a way that is like our other science instruments." The three figures are covered for the flight under thermal blankets, like much of the spacecraft. "They are all together, right next to each other [on board Juno], being friendly," Bolton said smiling. "They are the special passengers." The mini-metal statues are joined on the spacecraft by another "special passenger," one that also pays tribute to Galileo. A 2.8-inch by 2-inch (71 mm by 51 mm) plaque also made of flight-grade aluminum is bonded to Juno's propulsion bay with a spacecraft-grade epoxy. The graphic on the plaque shows a self-portrait of Galileo. The plaque also includes — in Galileo's own hand — a passage he made in 1610 of observations of Jupiter, as was archived in the Biblioteca Nazionale Centrale in Florence, Italy. "This came from the Italian Space Agency, who is one of our big partners, probably the largest of the international partners ... they developed this commemorative plaque to honor Galileo," Bolton said. "I think it is a great thing [to] help the public understand the contributions that this great discovery during the Italian renaissance brought to our society." Galileo's text included on the plaque reads as follows: "On the 11th it was in this formation -- and the star closest to Jupiter was half the size than the other and very close to the other so that during the previous nights all of the three observed stars looked of the same dimension and among them equally afar; so that it is evident that around Jupiter there are three moving stars invisible till this time to everyone." "The revelations that occurred from that discovery are still with us," Bolton said. "Understanding that we are not the center [of the solar system], in fact there are things going around Jupiter, another planet, certainly affected all of us both technologically as well as philosophically." "We're carrying all these instruments and of course, our primary goal is to get all this new science data and bring it back to Earth to help us understand how we got here and what's going on [in the solar system], to help us answer our children's questions. Along that way, we also wanted to commemorate and take a little piece of us to Jupiter," Bolton said of the plaque and LEGO figures on board. Juno's main goal is to understand the origin and evolution of Jupiter. The solar-powered probe — its three tractor trailer-size solar panels the first to power a spacecraft so far from the sun — will map the planet's gravity and magnetic fields to learn what Jupiter's interior structure is like. Juno's color camera will provide close-up images of Jupiter, including the first detailed glimpse of the planet's poles. In addition to expanding scientists' knowledge about the solar system's largest planet, Juno's investigations will provide clues about what conditions were like in the early solar system when Jupiter was forming. Knowing more about Jupiter's origins and how it evolved will also help scientists better understand the many planetary systems being discovered around other stars. See the Galileo plaque and more photos of the LEGO minifgures at collectSPACE.com.